One of my favourite old family photos was taken just over fifty years ago in the summer of 1966. Though the First World War seems a very long time ago, this picture bridges the past and connects me to the event in a very special way. My Grandfather was wounded on one of the first days of the Battle of the Somme, in July 1916. He was shipped back to Hove in Sussex and nursed to health by the woman who became my Grandmother. I wonder if he was thinking about those things that summer as he sat for photos with his small grandson. He died three years later, the only grandparent I ever met. Funnily it was his younger brother, Captain Alan Lendrum of the Royal Inniskilling Fusiliers whose war experiences fascinated me and have involved me in research for the last ten years. I now live on Keble Street, home to four of the Summerstown 182. This is a project that can involve anyone and has the potential to provide a wealth of knowledge and understanding about this area and how it was affected by the events of a hundred years ago. But we could do with some help. We are still trying to identify three of the 182 and to date we have only got photographs of thirty of them. About a third of them, we still know absolutely nothing about – but that’s the exciting bit, so much to discover! Since embarking on this just over three years ago, I have found that I see the area where I have lived for nearly twenty years in a new and exciting light. 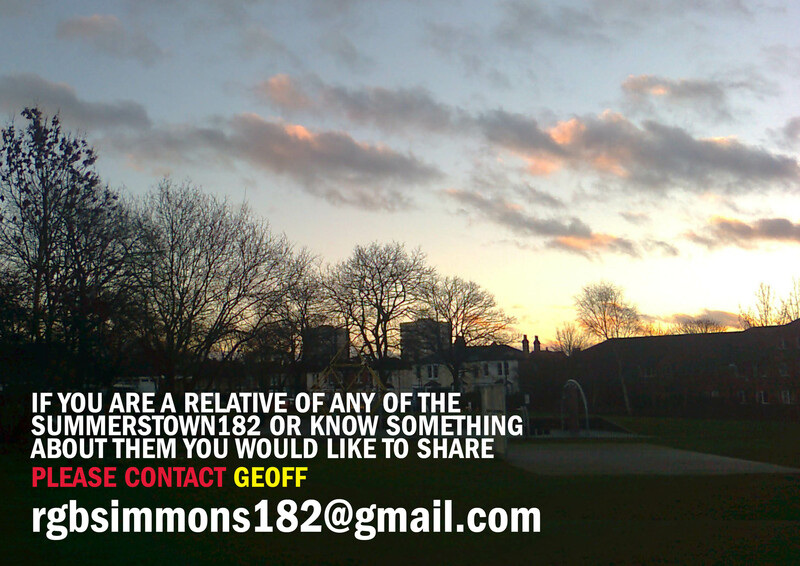 Most of the Summerstown 182 addresses are just a few minutes walk from my home. Some are still the same small terraced houses, others have been razed to the ground and are now flats, a convenience store or charity shop. But they are all very special because great sadness was once, sometimes even twice or three times, visited upon them. The poppy map has become so dense that it is difficult to read the street names. So many front doors to which a telegram was delivered and darkness descended. The effect repeated on a national scale indicates the enormous impact of the war on the British nation. We have specifically restricted the map to the 182 names on the St Mary’s Church war memorial. For whatever reasons, many other local men who died in the War did not have their names preserved on it and that includes the brothers of at least two of the 182. There is no reason why their stories can’t also be recorded. I can best be contacted via email rgbsimmons182@gmail.com. Much of the research on this project has been done by Sheila Hill, Chris Burge and Marion Gower. There has also been great support from Christine Marden, Dorothy Williams, Lynda Biggs, Kevin Kelly, John Brown and Alison Milton. They have all played an immense part in getting this up and running. Thank you also to Sheena Callender of Big Up Films who identified our potential for Heritage Lottery Funding and submitted our successful application.